A care manager is a professional who can assist elders and disabled persons and their families in a variety of ways. What does an ElderCare Resources care manager do? We evaluate the whole situation and identify areas for assistance, considering financial and insurance resources. We look at home safety and emergency plans. We oversee medical care; ensure communication among health care providers; organize and schedule medications; make appropriate referrals; and accompany patients to health care provider appointments. Our care managers make home visits! 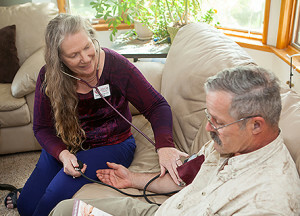 We arrange the right kind of in-home care services; coordinate respite for the primary care partner; screen and monitor paid care staff; and help with household management. We review income, assets, insurance, and spending; can discuss Medicaid eligibility. We check estate documents (will, advance health care directive, Power of Attorney); make referrals to elder law specialists. We keep family members near and far informed about the elder or disabled person. We are skilled at communicating with confused or cognitively impaired persons and being the care team liaison. We explore appropriate stay-at-home or move planning options; assist in the details of executing a move to or from a care community. Our staff is on call 24 hours a day, every day, to respond to urgent needs. Assessment and relation set-up so that we can act quickly if/when services are needed; resource connections to maximize your quality of care. Provide detailed information about your health to your health care providers, to help ensure that you get the attention you need, especially for not-so-obvious problems. Request records transfers so that all health care providers have your medical history. Keep prescription information up to date for all your care providers and you. Keep track of appointments and follow-up care needs. Arrange transportation to appointments; arrange for someone to accompany the patient when appropriate. Inform family of important changes in your health. Ask questions that the patient may not know are important. Provide home follow-up for any health care provider’s orders. See our Fee Structure page for rates. We are a fee-for-service company. I believe that each person around the table that morning wanted to get all the information about memory loss from you that we possibly could. Your passion for caring for your clients and their families was very evident. May you continue to use your training and your talents to bless the lives of those who are hurting. I hope it will be possible for you to speak to our group again."